A doublet intraocular lens optimized for both chromatic and monochromatic aberration correction in pseudophakic eyes is presented. Ray-tracing techniques were applied to design the lens in white light within a chromatic eye model. Combinations of two materials, already commonly used in intraocular lenses, as acrylic and silicone, were used. Iterative optimization algorithms were employed to correct for longitudinal chromatic aberration, spherical aberration and off-axis aberrations within 10 degrees of visual field. The performance of this lens was compared with a standard single-material aspheric intraocular lens. Near full aberration correction was achieved with the doublet intraocular lens. The modulation transfer function and Strehl ratio were superior for the doublet lens. Throughfocus calculations were also conducted showing better optical quality for the doublet. 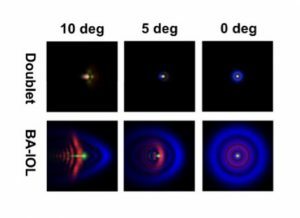 Real higher-order aberrations from normal eyes were incorporated in the model to evaluate the effect on the doublet intraocular lens performance. Results showed that the doublet lens preserved its benefits under realistic conditions. This doublet intraocular lens should provide patients with a better quality of vision after it is further developed in terms of manufacturing and surgical limitations.